Making a dramatic appearance soon? 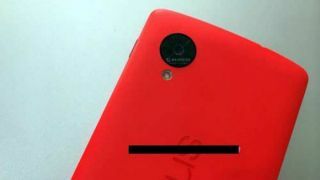 Looks like the mysterious scarlet Nexus 5 will arrive during a month appropriate for its hue. A sneaky leakster posted an image of an internal memo from US carrier Sprint which plainly states that February 4 is when the red Nexus 5 will appear in Google Play Stores. With February filled with all things red and pink for Valentine's Day, it makes sense that Google would want to show off its own blushing beauty. We've seen various clues sprinkled here and there mentioning the red handset will likely drop in late February or March. The latest trail leads to a fuzzy red Nexus box, which may nip the rumors in the bud - if it didn't look so suspicious. But we'll only have to wait less than a week to see if we've sniffed out the right date.